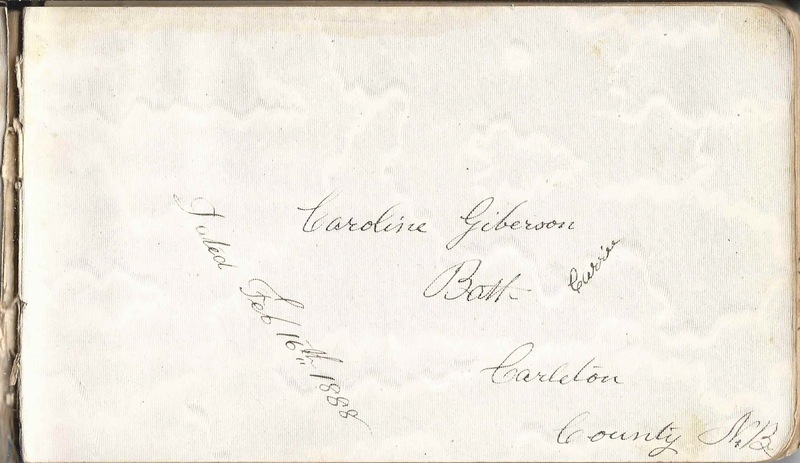 1880s autograph album of Caroline Brown Giberson, "Carrie", who was born in 1869 at Bath, New Brunswick or in the area. See images of the entire album in page order at the end of this post. The album is approximately 7" x 4-1/4" and contains 64 pages signed by Carrie herself and her relatives and friends, some of them twice. 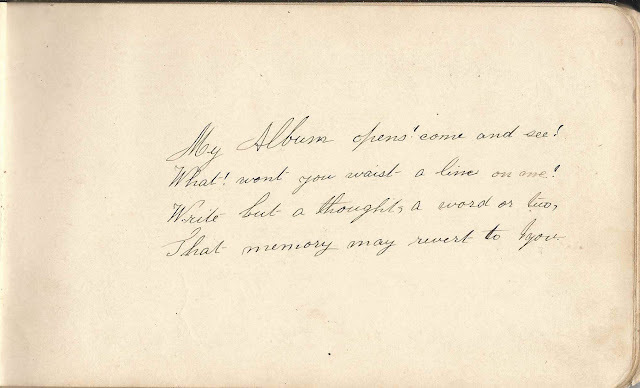 Carrie inscribed a page to those who would sign a page in her album. 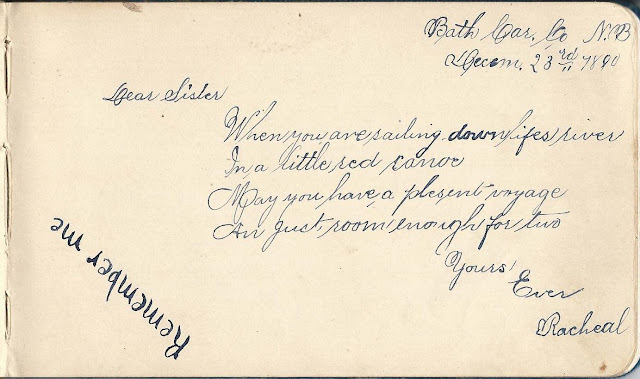 Caroline Brown Giberson was born 17 March 1869 at Bath, New Brunswick, daughter of Ralph Kinney Giberson and Mary Elizabeth (Ebbett) Giberson, who were born at Bath, New Brunswick, and Wicklow, New Brunswick respectively. Carrie's paternal grandparents were William and Temperance (Kinney) Giberson. William died in 1887 and did not sign a page in Carrie's album, but I believe the page below was signed by Carrie's paternal grandmother, Temperance (Kinney) Giberson in 1888. Carrie's maternal grandparents were Joseph Ebbett and Rachel (Hutchinson) Ebbett. 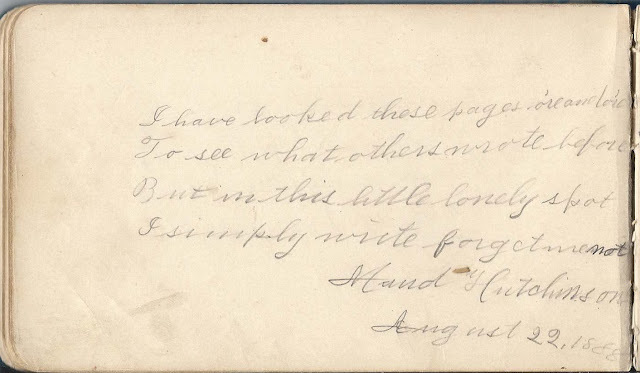 Neither of them signed a page in Carrie's album, although a person by the name of Maud Hutchinson signed a page in 1888. 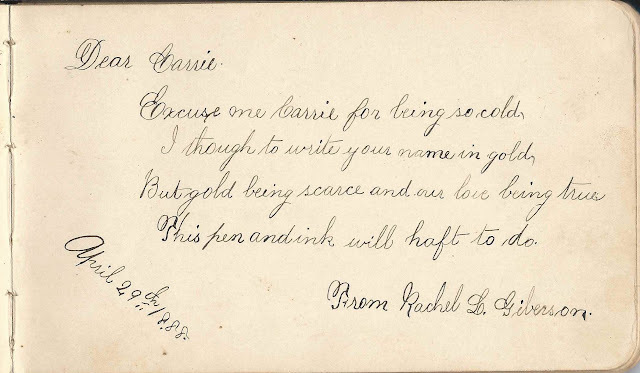 Carrie's sister Rachel Levina Giberson signed a page in 1888 and another in 1890. Rachel married Frederick Dibble Giberson. Two pages in the album were signed by a Dibble Giberson, perhaps one or both of them signed by Rachel's future husband. 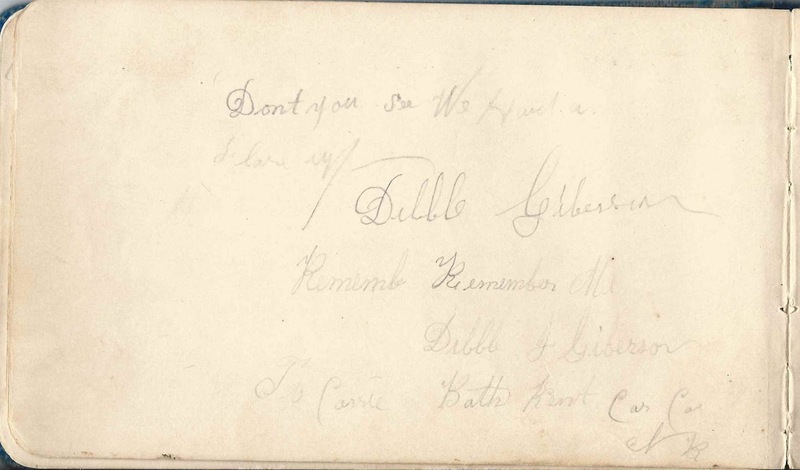 The signature below looks like Dibble J. Giberson but could be Dibble F. Giberson. Carrie's sister Temperance Giberson signed the last page in her album in 1890. In the early 1890s, Carrie moved to Maine. On 4 February 1893 at Presque Isle, Maine, she married Josiah Starbird Hodgdon, son of Josiah Smith Hodgdon and Joan W. (Starbird) Hodgdon. Josiah Starbird Hodgdon was born 5 March 1862 in Oxford County, Maine. 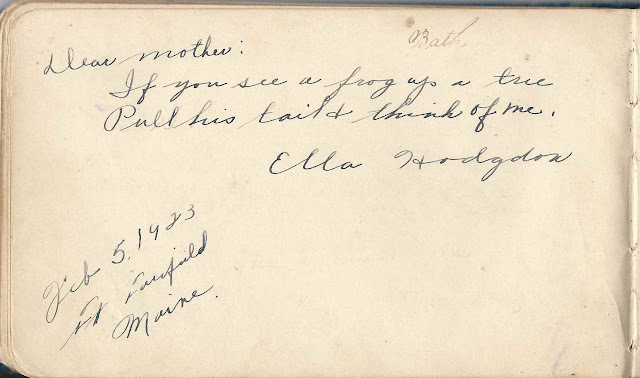 Carrie and Josiah had, I believe, five children, the last of whom, Ella Ruth Hodgdon, signed a page in 1923 in her mother's album. It's neat to imagine that Carrie was going through her treasures, and the autograph album, by then some thirty-odd years old, came to light. Ella must have been with her or perhaps discovered the album herself and asked to sign a page. 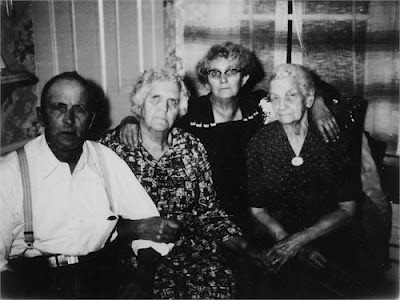 This is a photograph, I think, of Caroline and her siblings, with Caroline identified by a reader as the woman at right. The others are, left to right, Ransford, Rachel and Mary. Her siblings, left to right, are Ransford, Rachel and Mary. If you have corrections to the information above or stories to share about the Giberson or Hodgdon families, please leave a comment or contact me directly. Refer to the alphabetized list below for several more people surnamed Giberson and several people who identified themselves as Carrie's cousin. 1880s autograph album presented to Maggie C. Parsons for punctuality by her teacher Minie E. Smith of Chicopee, Maine, a section of Buxton, Maine. Small album, approximately 5-1/2" x 3-1/4", filled with around sixty-nine autographs of relatives, friends and teachers. Margaret Clara Parsons, "Maggie", was born 29 November 1873 at Buxton, Maine, daughter of Albion K. P. Parsons and Rosanna D. (Davis) Parsons, who were born at Buxton, Maine, and Limington, Maine, respectively. 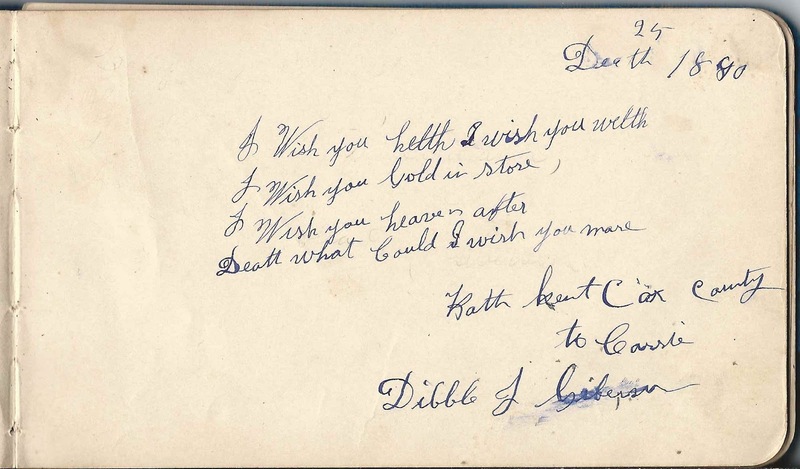 Two of Maggie's siblings signed pages in her album. 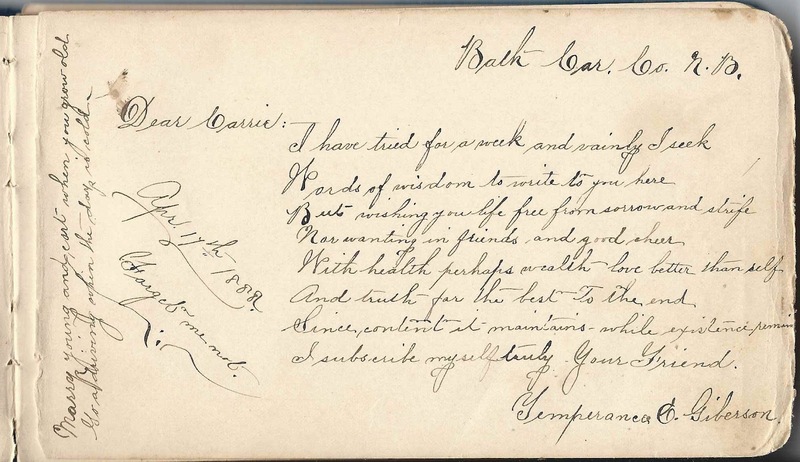 First, Howard M. Parsons of North Buxton, Maine, signed a page on January 12, 1884. 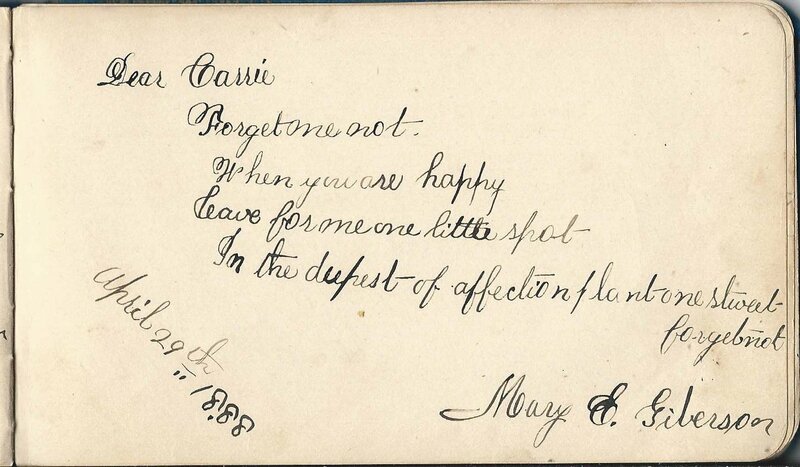 Maggie's sister Maud E. Parsons signed an adjacent page on the same day. 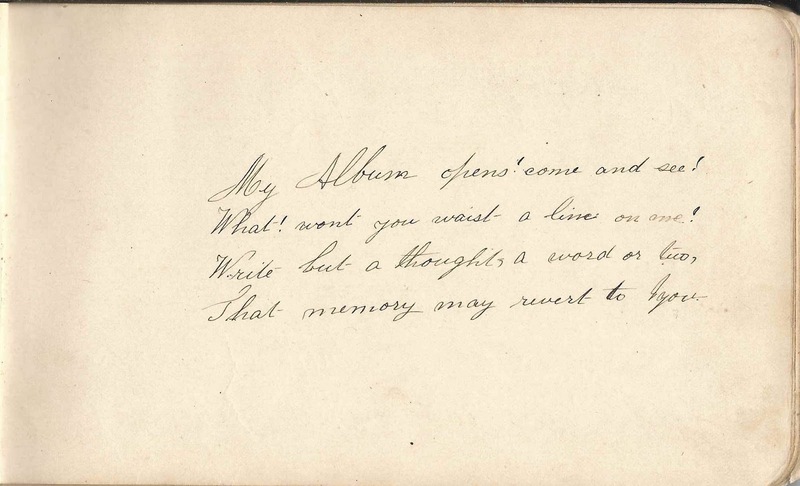 Lizzie Severance of West Buxton, Maine, signed a page in 1887. She called herself Maggie's cousin. On 10 April 1893, Maggie married George Ellsworth Bangs of Buxton. 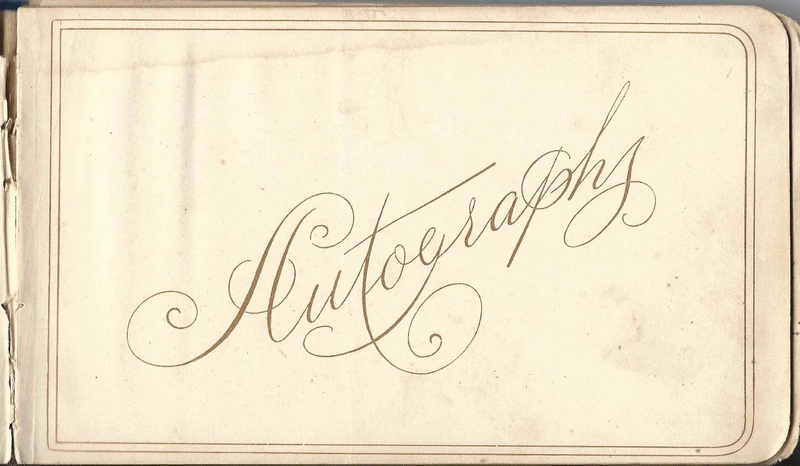 He had earlier signed a page in her album, in 1887. Maggie and George were still living at Buxton, Maine, by the time of the 1940 Census. They had raised at least two children while George worked as a farmer and as an interior painter. In addition to teacher Minie E. Smith who signed the presentation page, teacher T. V. Smith of Groveville, Maine [another section of Buxton, Maine] signed a page. Two people, or perhaps the same person, drew lovely pen and ink sketches. First, Mrs. Frances E. Moore of Standish, Maine. 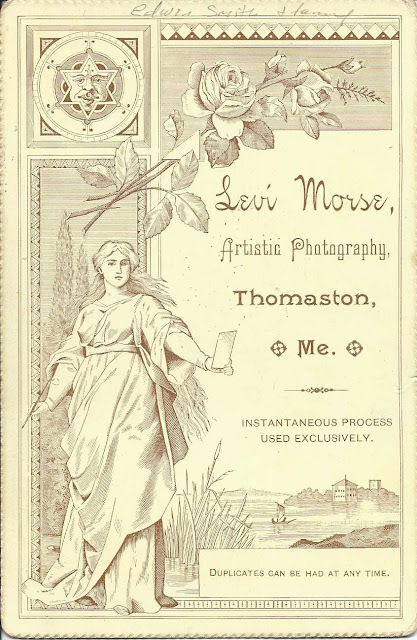 J. P. Moore, another person, or perhaps Mrs. Frances E. Moore. J. P. Moore; beautiful pen and ink sketch of a fancy spoon; perhaps she is Mrs. Frances E. Moore? 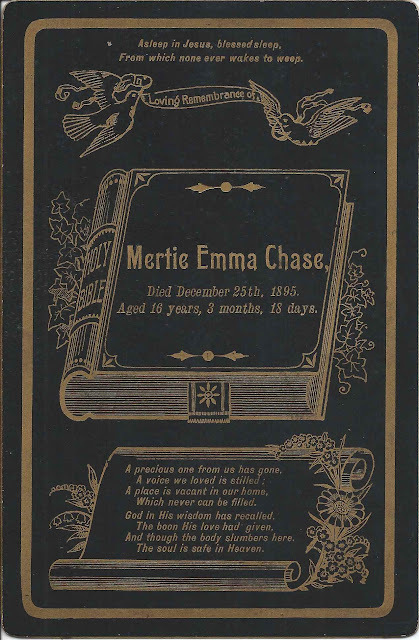 M. B. Smith of West Hollis, Maine, 1887; "Thy friend"
Memorial card printed on the occasion of the death of young Mertie Emma Chase of consumption on December 25, 1895, "Aged 16 years, 3 months, 18 days". Her parents would have grieved on any day, but Christmas must have been particularly hard. Mertie Emma Chase was born September 7, 1879 at Atkinson, Maine, the daughter of Albert H. and May M. (Farnham) Chase, who were born at Sebec, Maine, and Atkinson, Maine, respectively. Mertie died at nearby Milo, Maine. Her mother died several years later; her father lived until 1936. 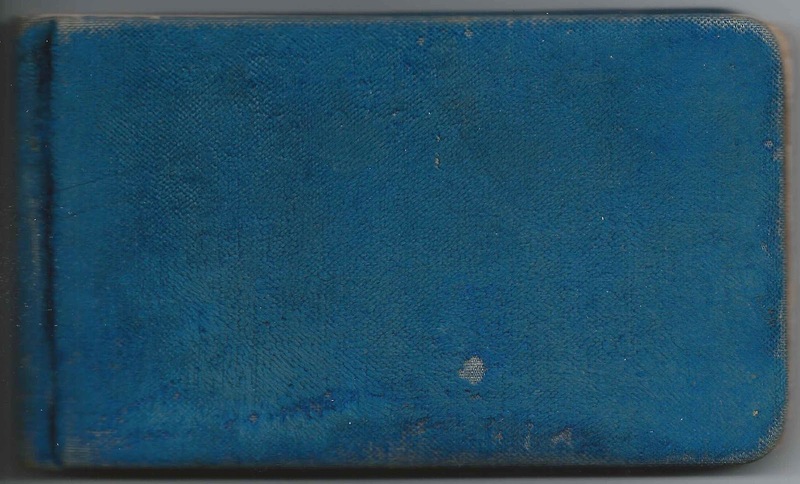 This card was found with a similar one for Esther J. (Lancaster) Chase, but I didn't find a close relationship between Esther's husband Lorenzo Chase and Emma's father Albert H. Chase. 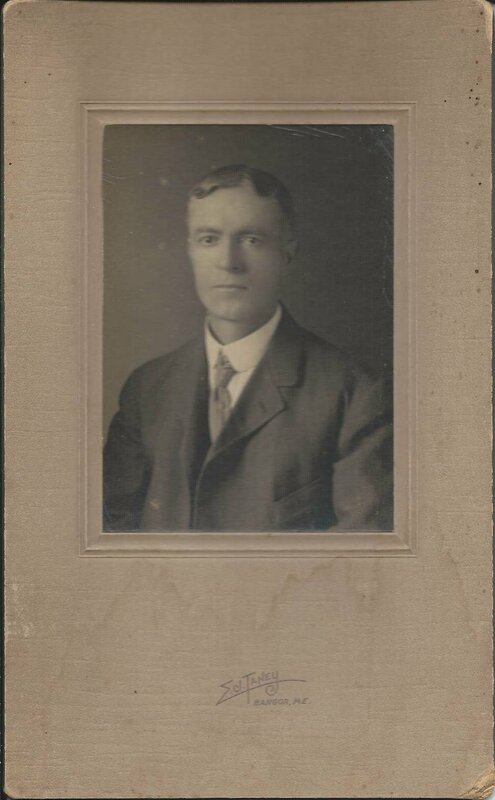 Photograph of Wilber Fiske Jackman and signed by him on 14 February 1912. The photograph was taken by the Taney studio of Bangor, Maine. 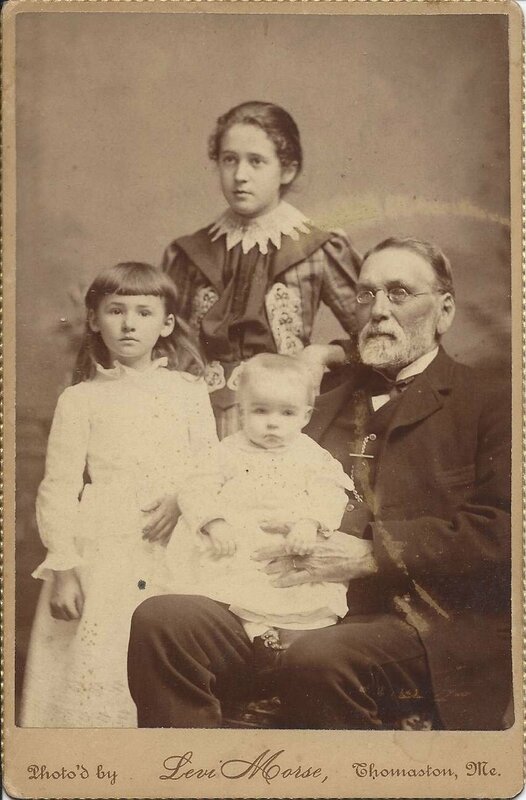 Wilber Fiske Jackman was born about February 1861 in Michigan, son of Jeremiah F. and Sarah Hollis (Howes) Jackman. I found conflicting information online for the parents' birthplaces. Jeremiah F. Jackman may have been born in England or New York. Sarah Hollis (Howes) Jackman may have been born at Ashfield, Massachusetts, or New York. I'm leaning toward the first of each possibility. Dr. Wilber Fiske Jackman was a professor at the University of Maine at Orono from 1895 to 1913. He was the first to lead the Pharmacy Department. After leaving the University of Maine, he taught in the College of Pharmacy at the University of West Virginia at Morgantown. I found a marriage record that shows Dr. Jackman married Annie E. Peters on 29 January 1896 at Detroit, Michigan. Annie and their four children are listed with him in the 1900 and 1910 Census of Orono, Maine. He may have been married before as I found newspaper clipping online noting a marriage on 9 January 1888 at Ann Arbor, Michigan, of Wilber F. Jackman and Sarah Donnelly. Family Search shows birth records for twin daughters of a Wilbur F. Jackman and Sarah Jackman. 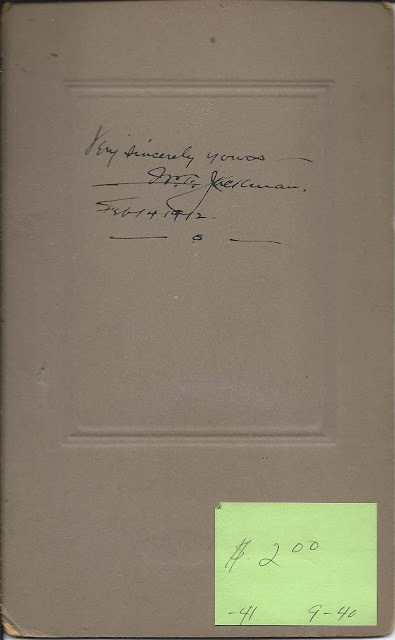 I believe that Dr. Jackman died in 1918. If you have corrections or additions to the information provided above, please leave a comment or contact me directly. 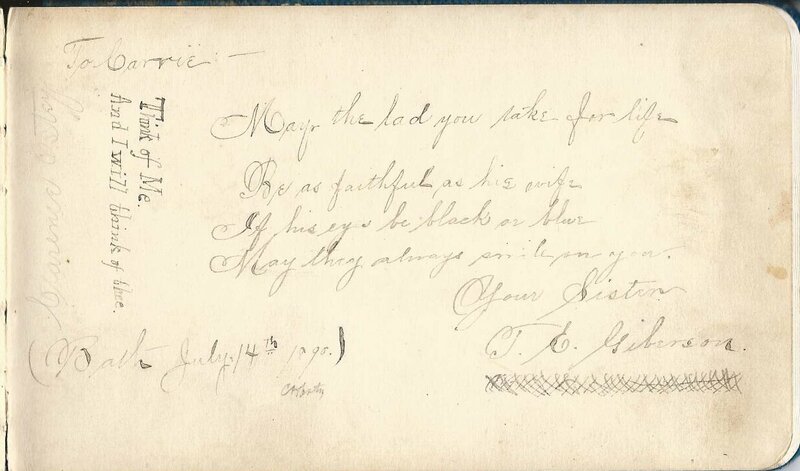 Handwritten marriage intention between Mr. Nathaniel G. Jenness and Miss Emeline E. Lang, dated 20 March 1847 and signed by John A. Trefethen, Town Clerk of Rye, New Hampshire. Nathaniel Gilbert Jenness was born 21 November 1822 at Rye, New Hampshire, son of Samuel and Clarissa (Jenness) Jenness. Emeline E. Lang was born 28 September 1829 at Rye, New Hampshire, daughter of Leonard and Data (Garland) Lang. Nathaniel and Emeline fulfilled their marriage intention on 11 April 1848. I believe the couple spent their lives at Rye, New Hampshire, where they raised at least two children. Nathaniel died 12 March 1897 at Rye, New Hampshire. Emeline died 31 October 1913, also at Rye. The Town Clerk who handwrote the marriage intention was John Adams Trefethen, who was born 27 July 1799 at Rye, New Hampshire, son of Captain William and Elisabeth (Tucker) Trefethen. In November 1834, shortly after he signed the marriage intention above, John married Mary Locke, daughter of Joseph and Abigail (Marden) Locke. Mary was born 25 September 1809 at Rye, New Hampshire. They had at least four children and lived their lives, it appears, at Rye, New Hampshire. In addition to being Town Clerk, John served as a selectman, school teacher and state representative. He died 5 October 1870; his widow Mary died 30 September 1888. 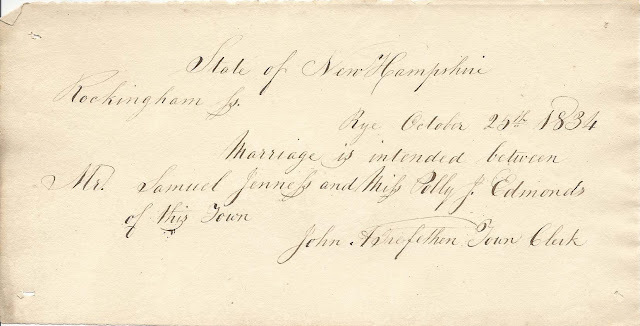 See another blog post for the marriage intention of Nathaniel Gilbert Jenness' first cousin, once removed, Samuel Wallis Jenness and Miss Polly J. Edmonds, dated 25 November 1834 and also signed by John A. Trefethen, Town Clerk of Rye, New Hampshire. 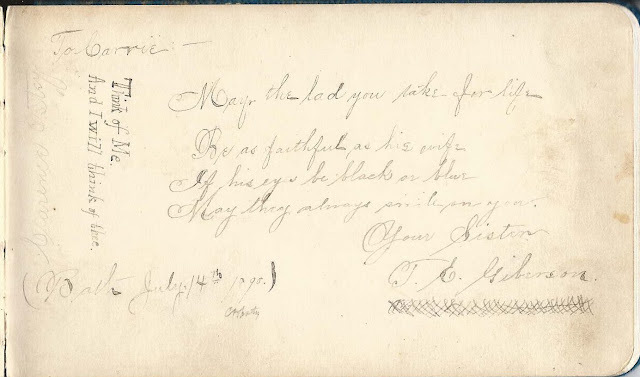 Handwritten marriage intention between Mr. Samuel Jenness and Miss Polly J. Edmonds, dated October 25, 1834 and signed by John A. Trefethen, Town Clerk of Rye, New Hampshire. Samuel Wallis Jenness was born June 17, 1787 at Rye, New Hampshire, son of Levi and Elizabeth (Wallis) Jenness. Polly J. Edmonds was born March 16, 1806 at Rye, New Hampshire, the daughter of Jonathan and Mary Molly (Berry) Edmonds. Samuel Wallis Jenness and Polly Jenness Edmonds fulfilled their marriage intention on July 19, 1835 at Rye, New Hampshire. Polly was the second of Samuel's three wives. Samuel's first wife was Abigail Perkins, daughter of James and Mary Molly (Perkins) Perkins. Samuel and Abigail had, I believe, eight children. Abigail died March 13, 1833. I couldn't find a record of any children born to Samuel and Polly, but there may have been some. Polly died August 17, 1841 at Rye, New Hampshire. Samuel's third wife, whom he married on February 11, 1844, was Sarah S. Randall, daughter of Jacob and Anna (Shute) Randall. I didn't find a record of any children born to Samuel and Sarah. 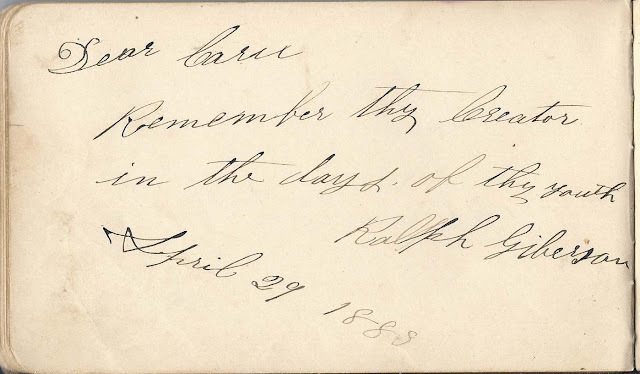 If my information is correct, Sarah died March 1, 1875 at Rye, New Hampshire, and Samuel died the next day. 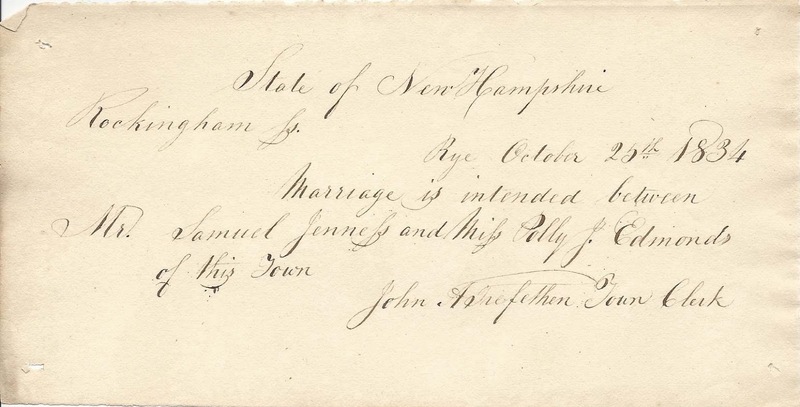 The Town Clerk who handwrote the marriage intention was John Adams Trefethen, who was born July 27, 1799 at Rye, New Hampshire, son of Captain William and Elisabeth (Tucker) Trefethen. In November 1834, shortly after he signed the marriage intention above, John married Mary Locke, daughter of Joseph and Abigail (Marden) Locke. Mary was born September 25, 1809 at Rye, New Hampshire. They had at least four children and lived their lives, it appears, at Rye, New Hampshire. In addition to being Town Clerk, John served as a selectman, school teacher and state representative. He died October 5, 1870; his widow Mary died September 30, 1888. 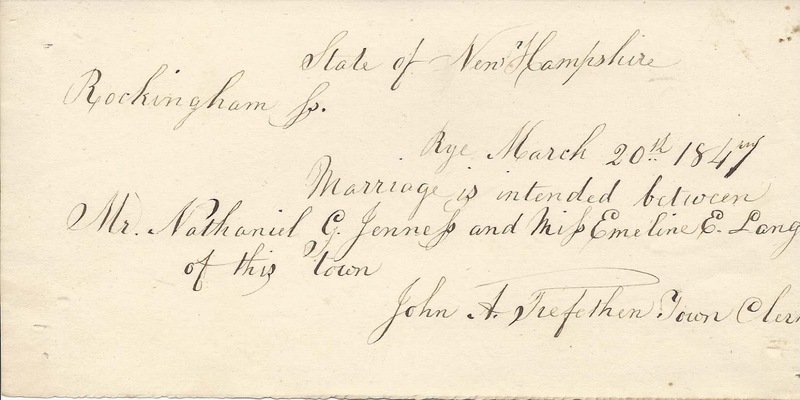 See another blog post for the marriage intention of Samuel's first cousin, once removed, Nathaniel Gilbert Jenness and Miss Emeline E. Lang, dated March 20, 1847 and also signed by John A. Trefethen, Town Clerk of Rye, New Hampshire. 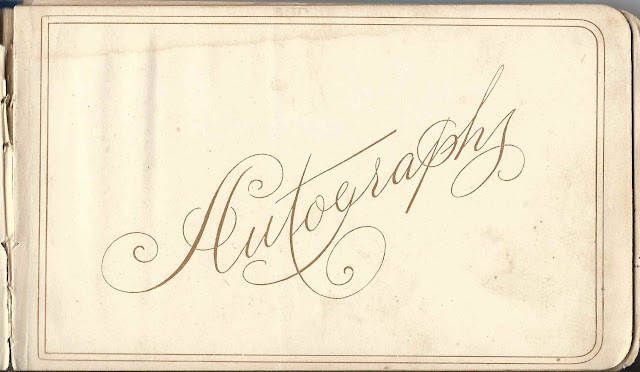 1880s era autograph album, approximately 4-1/4" x 3", with seventeen signers mostly from the North Yarmouth, area, including that of teacher Anna Abrams. Several Cinderella-related illustrations. If you have information on any of the signers, please leave a comment or contact me directly.